Pour flax and chia seeds into a large bowl. Add 6 cups of filtered water and soak overnight. Add more water if the mixture seems stiff. The resulting mixture should have a pudding-like consistency. Dice pear and stir into the mixture along with all remaining ingredients. 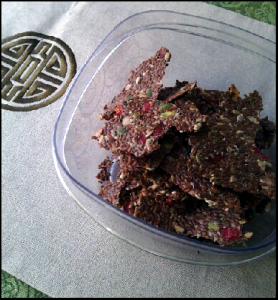 Spread mixture in a thin layer onto dehydrator sheets lined with parchment paper. Dehydrate at 105 degrees for 6-12 hours depending on how wet your mixture is and how thin it is spread out. Peel crackers off of the sheets and break into pieces. Store in an airtight container.